Home » Blog » Giveaway: FilterPro Dehydrator by L’EQUIP! Giveaway: FilterPro Dehydrator by L’EQUIP! Check your email for prize details! Today I am thrilled to be giving away a L’EQUIP dehydrator valued at $150! This appliance is a great way to preserve fresh fruits and vegetables when they are in season. A lot of readers complain they can’t find good, organic store-bought dried fruit without a bunch of additives like sugar, and if you’re the lucky owner of a dehydrator you have the ability to make your very own “real food” snacks just the way you like them. You can even make homemade fruit leathers and beef jerky, too! You can find all L’EQUIP dehydrators as well as their other products on www.boschmixers.com or visit www.lequip.com to find a retailer near you. The contest is open to those with a U.S. shipping address only. To enter the contest, please leave a comment below sharing why you would like this dehydrator. Only one entry is allowed per person UNLESS you follow L’EQUIP on Facebook. If you are one of their Facebook fans (or become one) you are allowed two entries! You can just say that you “follow” on your second entry. The contest will end at midnight EST on Monday, November 21. Giveaway: L'EQUIP Nutrimill Grain Mill! I love to snack on dried apples and would love even more to be able to make them at home! Oooh, I wanna be able to have my own dried fruits and veg (from peak season throughout the year)! It would be absolutely WONDERFUL to be able to dry my own fruits! (and a few veggies, too) Then I would know just what is there—-only the fruit or veggie and nothing else. I am always looking for healthy snacks for my kids, and this would be a great tool to make some without all the added sugar. My mom made homemade fruit leather when I was a child…it would be great if I could do that now for my own kids. Her machine was twice the size of this one- Lol! I would love to be able to make homemade fruit leather for my daughters and this would help me to just that! I would love to be able to make my own dried fruits and jerky! i have been dying to make kale chips! It would be so nice to be able to make fresh dried fruit, roll ups and other things for my family without any added sweenteners or chemicals. I try to make most all of our food from scratch and this would add to our homemade menu. Thank you for offering such a great product in your giveaway! To preserve the nutrients in whole foods. To use my fresh veggies from my garden. I think this would be a great idea to make snacks for kids and the whole family. After only eating processed foods, chips, and just bad healthy foods it is hard trying to teach your kids the opposite. Switching to whole, “real” foods has been a change but this would make it a little easier, cheaper and may I say sweeter?! I would love to dry my own fruit to use in whole food energy bars! Having a L’equip dehydrator would be the first step in helping move my family into a better more nutrition way of eating. Wow! This dehydrator looks exactly like what I’ve been looking for! As a cancer survivor, I shop at a farmer’s market for organics–but I live alone and there’s always too much to eat fresh. A dehydrator would certainly help me a lot! I would love the dehydrater. I love dried fruit of all kinds, and to make it myself would be even that much better. I would looove this! I love dried fruit and would love to make jerky and fruit strips! I follow you on facebook. I love this site. I would love the dehydrator, because my 4 girls would absolutely love banana chips and dried apples. I would love to get all natural ingredients into them. I have a seven month old and I would love to start him off right with healthy, yummy snacks! Would love to have one of these to preserve fruit for yummy snacks for my girls! We love dried fruit, but it is too expensive for us to purchase these days. wow serendipity! I was just talking about getting one of these today so I could make my own kale and flax chips! I would love to have one–I’m a 2x cancer survivor trying to adopt a healthier diet on a limited income! Thanks for the chance to win this!! I would love to win this to dry fruit. Yum! I’ve been looking at these! I love kale chips and homemade fruit rollups!! Had a tons of tomatoes this year and dehydrated them. Also dehydrated peaches (best kid snack ever!) and apples. This looks like a great unit to have! Would love to make healthy fruit snacks iwth the kiddos!! As a student, it becomes difficult to find healthy options while on the go. If I were to win this dehydrator, I would make dried fruits(mango, apples, peaches, etc. ), kale chips, flax cracker, and anything else I can get my hands on that can be dehydrated. My kids and I love kale chips and zuchini chips and this would be perfect for those yummy treats! I’d love one because I have three kiddos now and don’t want them eating the stuff in most commercially dried fruit! As an outdoor enthusiast who hikes and kayaks being able to dry my own fruits and veggies that are in season would be a great addition to the snacks I bring on my trips. I am looking for ways to get my picky ADHD/Sensory Processing son to eat healthier food. Trying to keep him on an organic, non processed food diet has been a challenge to say the least. I am hoping to make snacks for school and lunches, as well as at home. Would love to try and dry our own jerky! That way we know what goes into it and it’s much cheaper. I follow you on FB so here is my second entry, I would love to have this new appliance ! I have been buying a lot fruit and some goes bad before I get to eat it. We are lucky enough to be near an Aldi and there fruit prices are amazing. So now I need a way to store it all. It would mean the world to me if we(my special needs daughter and I) would love to win the dehydrator, because at my age (64) I just can’t afford one at this time and I would love to have my own dried fruit and veggies to snack on. Especially for my daughter when she goes to day camp. It would really be wonderful to win the dehydrator. I found a dehydrator at a thrift store, it’s a piece of crap. The L’EQUIP FilterPro Dehydrator would be an absolute god send. I grew up with my mother’s BOSCH dehydrator that is still going strong today – 31 years old! And I’m sure the FilterPro will also stand the test of time and be going strong when I’m 60! L’EQUIP is now a friend and being followed by me on twitter! We follow you on Facebook and look forward to each entry posted. My husband and I are both retired and have been working on creating a self sufficient home. Part of this plan is striving to keep our body healthy and flexible by growing and preserving our own foods and buying meat from known sources. 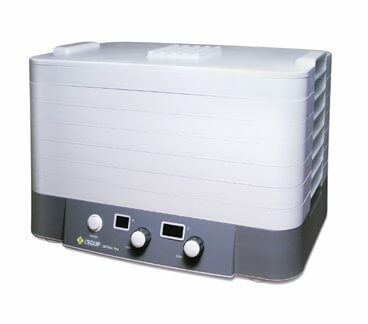 A food dehydrator would definitely contribute to our cause by giving us variety in our food preservation. I would love to make my three children healthy snacks. In an effort to make our household as, “processed-free” as possible, a dehydrator would help give us more options…and one more step toward convincing my husband the benefits of processed-free eating! I would love to have a dehydrator mainly to make sprouted almonds. Regular almonds upset my stomach, but not sprouted ones. Sprouted almonds are more costly when I can find them in the stores. We love jerky! And would love to make our own healthy jerky. We love dried fruit, but the store brands are full of sugar so we would love to dry our own. As l am a big dog lover, l have recently started making doggie treats. Sharing dehydrated dog friendly, healthy fruits is my current mission. Share the dream thank you.